Set on Mauritius' east coast, the glittering white beaches and blue waters of Belle Mare entice visitors from all over the world. 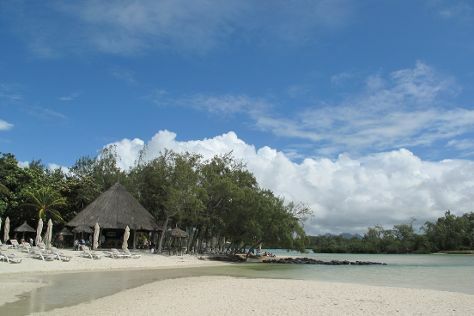 In addition to outstanding beaches, Belle Mare attractions include golf courses and a water park. The area's lagoon remains a perfect place for snorkeling and diving with exotic marine life, like eagle rays and an occasional shark. If swimming with these creatures makes you nervous, opt for a glass-bottomed boat ride instead. Belle Mare is in Flacq District. Take a peek at our online itinerary creator: Belle Mare and its charms laid bare and easily scheduled.